This claim will be judged YES if by 1 Jan 2010 knowledge of a protein's amino acid sequence is sufficient to determine its tertiary structure in a given medium. Success is defined by the following criteria. Must not consist of all alpha-helix or all beta-strand/sheet. A structure is considered correctly predicted if the average RMS deviation of all backbone and side-chain atoms (excluding hydrogens) is less than .25 Angstroms or within the error bars of the experimental method used to determine the structure, whichever is worse. Any medium is acceptable-correctly determining crystal, solution, or vacuum structure satisfies this claim. Correctly predicting the structure of a region within a larger protein is acceptable, provided the region meets the criteria in (2) above and the predicted region is indicated before experimental determination of the structure. The Protein Structure Prediction Center at http://PredictionCenter.llnl.gov/ has information on the latest CASP (Critical Assessment of Techniques for Protein Structure Prediction) meetings. 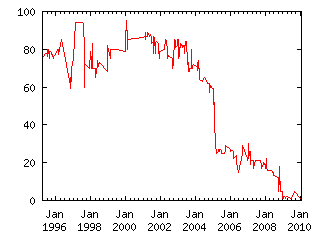 CASP1 was held in 94, CASP2 in 96. In the past, these meetings have centered around a large-scale contest of protein folding prediction techniques.